In many cases bone augmentation is necessary before implants can be inserted. Additionally, the soft tissue management can be a decisive factor for the implant success. In all cases the “Goldstandard” of using autologous bone is in competition with the use of Bone Graft Material products. 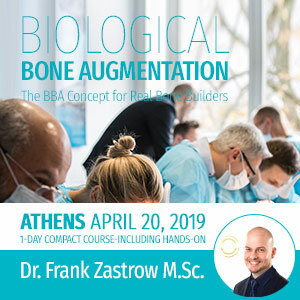 This course gives deep insights in the Concept of Biological Bone Augmentation (BBA) with pure autogenous bone and tissue and is addressed to all clinicians, who have already own experience in augmentation techniques. Clear guidelines for the use of autogenous bone harvesting and augmentation techniques in order to achieve predicable results will be provided as well as reliable techniques in complication treatment. In the `Simulation` session relevant bone harvesting and augmentation techniques will be simulated and trained on pork jaws. This course is limited to 30 participants. Dr. Frank Zastrow is an experienced oral surgeon and former senior physician at Professor Dr. Fouad Khoury, clinic Schloss Schellenstein in Olsberg, Germany. Now he leads his own private clinic in Wiesloch, Germany. His focus is the bone and soft tissue reconstruction in complex and compromised cases. 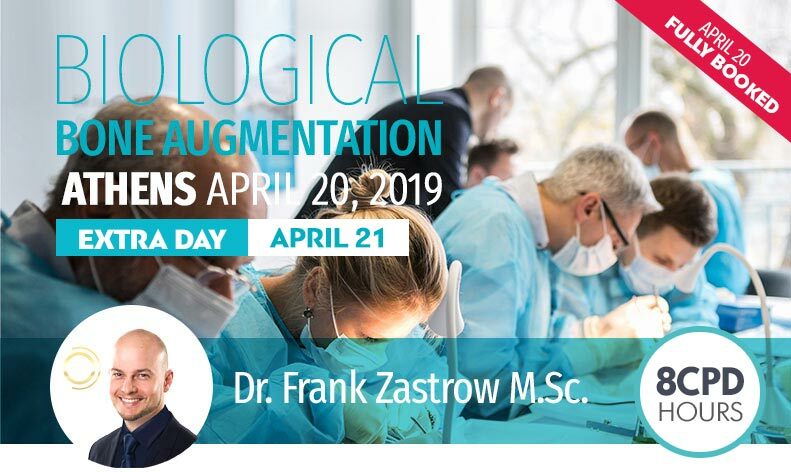 For this topic he is also an international speaker (www.frankzastrow.com) and founder of the facebook group `Real Bone Builders` -a platform for Biological Bone Augmentation, which focusses on working with pure autogenous bone and tissues. After he finished the dental school in University of Heidelberg, Germany, he became research associate at the oral surgery and maxillofacial surgery center of the University of Heidelberg (medical director: Prof. Dr. J. Mühling). 2008 he got licensed for dentistry and oral surgery, doctorate from University of Heidelberg. 2009-2012 he practiced as oral surgeon at the private clinic Schloss Schellenstein, Olsberg, Germany (medical director: Prof. Dr. F. Khoury) and from 2011 he was Senior Physician at the private clinic Schloss Schellenstein. 2011 he licensed to `Master M.Sc. Implantology and Dental Surgery in the University of Münster, Germany. Merimna Institute – Athens Greece Dr. Frank Zastrow M.Sc.